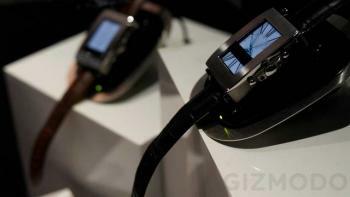 Toshiba has unveiled a (rather large and bulky) Bluetooth watch prototype called the Computer Graphics watch. It sports a 320x100 OLED panel (probably a PMOLED), an ARM processor and a Electrocardiogram (ECG) sensor. The idea is that this watch can sync to your smartphone for notifications and all sorts of applications (such as a heart-rate monitor which of course uses the ECG). This isn't a new idea. Sony is offering a similar Android accessory called the SmartWatch (which also uses a PMOLED display, by the way, although at 1.3"). Sony's SmartWatch costs $109. The first-gen Sony LiveView, by the way, is now down to only $22. Allerta developed a similar product (called the InPulse, again with an OLED display) for Blackberry devices, but it's no longer available. Allerta are now working on an E Ink watch that will connect to iOS and Android devices. Even Apple is rumored to be working on such a device, jointly developed with Apple. Apple's iWatch (or whatever they'll call it if the rumor is true will have a 1.5" touch PMOLED, apparently made by RitDisplay. Is Apple's iWatch device real?